Heartbreak Ridge is an addition onto the original Paynes Creek loop that adds an additional 2.2 miles of trail, turning this into about a 9.5-mile ride in total. The new Heartbreak Ridge section is basically more of the same: pretty mellow singletrack with some dips, rollers, a few short climbs and descents. Review: This was a fun addition to an already fun trail. It's nice and fast and adds more mileage to the existing trail. This place has definitely been kept nice and there is plenty of signage also. Review: As of the time of this writing, the trail is still pretty new, and still needs to get ridden in to develop the kind of flow that the rest of Paynes Creek has. Still, this is a nice addition, since it adds a significant amount of mileage, making this area a much better ride! 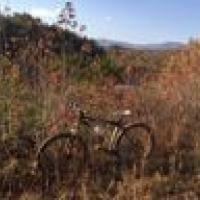 Heartbreak Ridge MTB Trail 4.00 out of 5 based on 2 ratings. 2 user reviews.